Caption: Preservative work will be undertaken by experts on a beaded mirror at Temple Newsam House. Visitors are to be given a rare opportunity to see close up how unique objects are preserved at a historic Leeds house. Specialist textile conservators led by Alison Lister, will be in situ at Temple Newsam House on 28 May and again on 5 and 6 June, as they work on a daybed and a settee which was made for the first Duke of Leeds in about 1700. Funding for the project has been provided by the Monument Trust, and Arts Council England. The Leeds Suite, which was given to Temple Newsam House in 1950 by Leeds born collector Sir Henry Price, is often referred to as one of the finest examples of late 17th century furniture and still has its original upholstery, including its cushions. Featuring in the preservative work will be the velvet upholstery and beautiful fringe trimmings which are over 300 years old. Conservation work is also going to start on a late 17th century beadwork mirror recently acquired by Leeds Museums and Galleries thanks to funding from Leeds City Council, the Art Fund and a V&A Purchase Grant. The intricate nature of restorative detail needed to be undertaken on the mirror will mean it has to be taken to a specialist conservation studio, before going on display once again for visitors to enjoy at Temple Newsam. "We are extremely fortunate to have a fantastic range of pieces and objects dating back hundreds of years in our museum and gallery collections. "In order to ensure they remain in excellent condition an amazing amount of time and effort is put in by our team, and as part of this unique opportunity, we are giving visitors the chance to see this work be undertaken on 17th century furniture located in the Crimson Bedroom at Temple Newsam House. "This really is not to be missed, and will provide a great insight into the attention to detail that has to be made to our collections to keep them looking so great for visitors." For more information regarding the project, please contact Natalie Raw, Leeds City Council’s Curator of Dress and Textiles at email:Natalie.raw@leeds.gov.uk or by Tel: 0113 3782103. The Duke of Leeds suite was made for either his London house or for Kiveton Park (later Hornby Castle) in Yorkshire. It was probably made by Philip Guibert, the royal upholsterer and furniture supplier to King William III and Queen Mary II. The luxurious upholstery of the suite is a Genoese cut silk velvet, which in its day was one of the most expensive textiles you could buy. 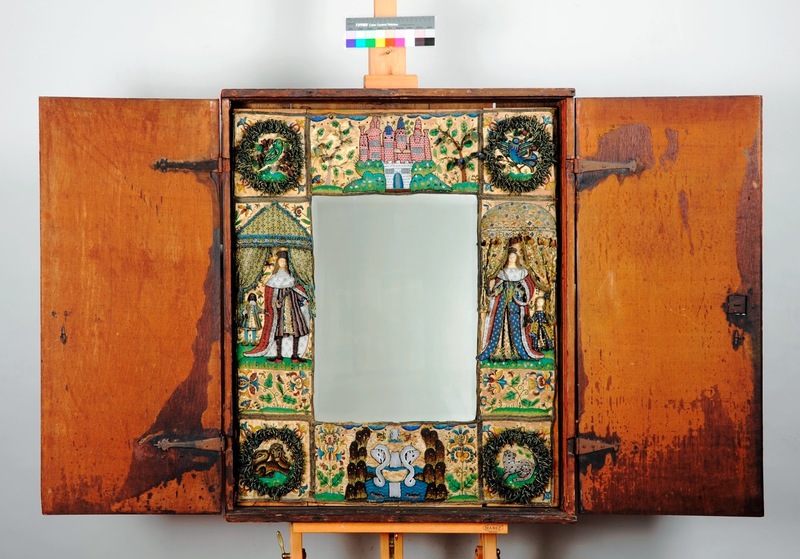 The beadwork mirror came to Temple Newsam from the Horton Fawkes family of Farnley Hall, Otley. The frame of the mirror is decorated with motifs of beautiful birds, lions, leopards and on either side stand figures represent King Charles Queen Catherine Braganza, all created out of thousands of hand-sewn on tiny glass beads. Temple Newsam House is a splendid Tudor Jacobean mansion, renowned as being the birthplace of Henry Lord Darnley, Mary Queen of Scots’ infamous husband. The House itself has over forty beautifully restored rooms and outstanding collections of fine and decorative art, along with a changing exhibition programme. Set within an Estate of 1500 acres of ‘Capability’ Brown landscape, Temple Newsam boasts paths and trails for cycling, walking and riding, an 18th century Walled Garden and national plant collections. Home Farm also holds a variety of rare breed animals and in the Stable Courtyard there is also a Tea Room serving locally sourced food, a large gift shop and Mrs Pawson’s local produce shop. Directions: 4 miles from Leeds City Centre off B6159, 2 miles from M1, junction 46.